Miss MBaF turned 3 yesterday and I turned 3-something last week (at one point I was informed her due-date was on my birthday – but there was NO WAY I was going to be sharing!). With the palava of birthdays and a few days away, I haven’t got much gardening done for a fortnight. Despite now being a “big girl” Miss MBaF still needs a nap some days, and I like to make the most of these halcyon afternoon hours! 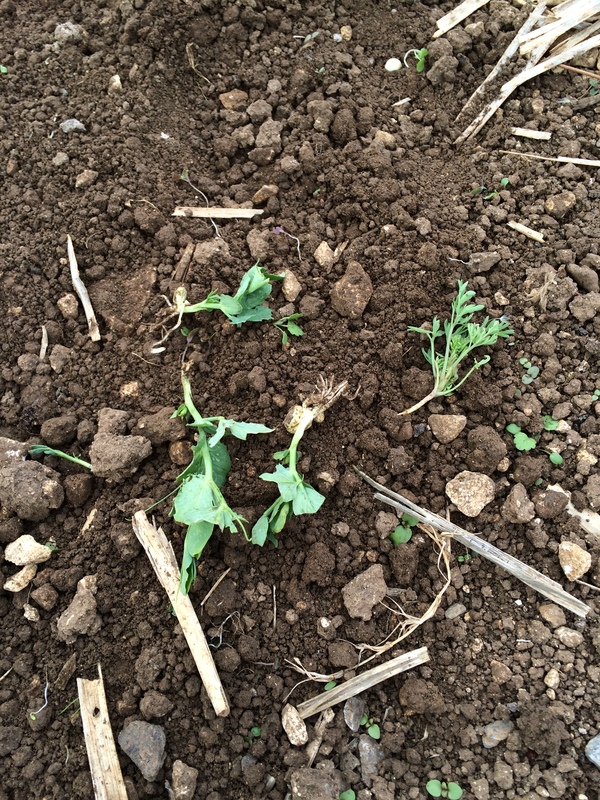 First was to call it quits on the early sowings of carrots, beetroot and peas that haven’t done much. I hoed-up the few shoots that had appeared and started over. In again went carrots (Amsterdam forcing) and beetroot (Rainbow mix), and peas (Kelvedon Wonder). You may remember that Miss MBaF was ‘in charge’ of sowing the peas the first time. Whether this has anything to do with their poor germination, I wouldn’t like to say, but to be fair the mangetout she sowed/plonked is looking better. 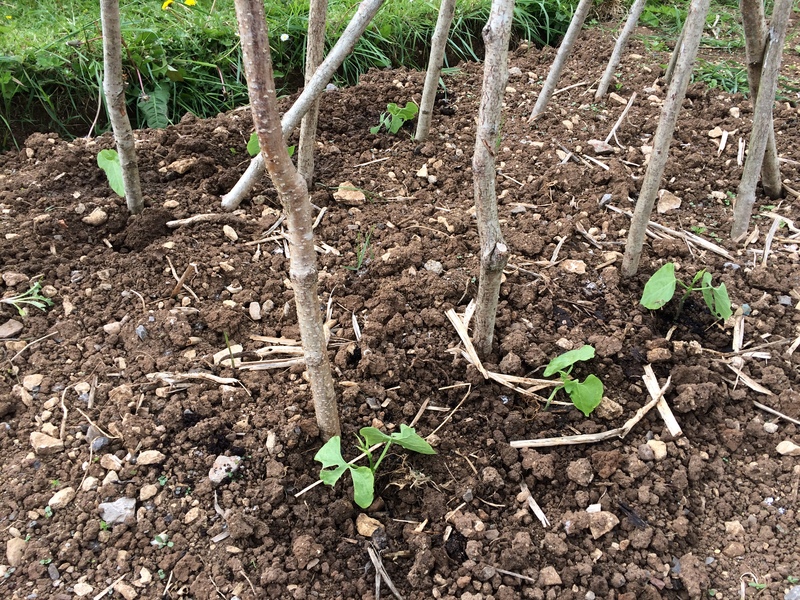 Next up was to get some sweet peas and climbing French beans in the ground. The former have been doing well in my coldframe, and I’ve left the lid half open for the past week, so I figure they’re sturdy enough to go out now. I’m running a little trial with the beans. I forgot/didn’t get around to digging muck into the ground they were destined for. 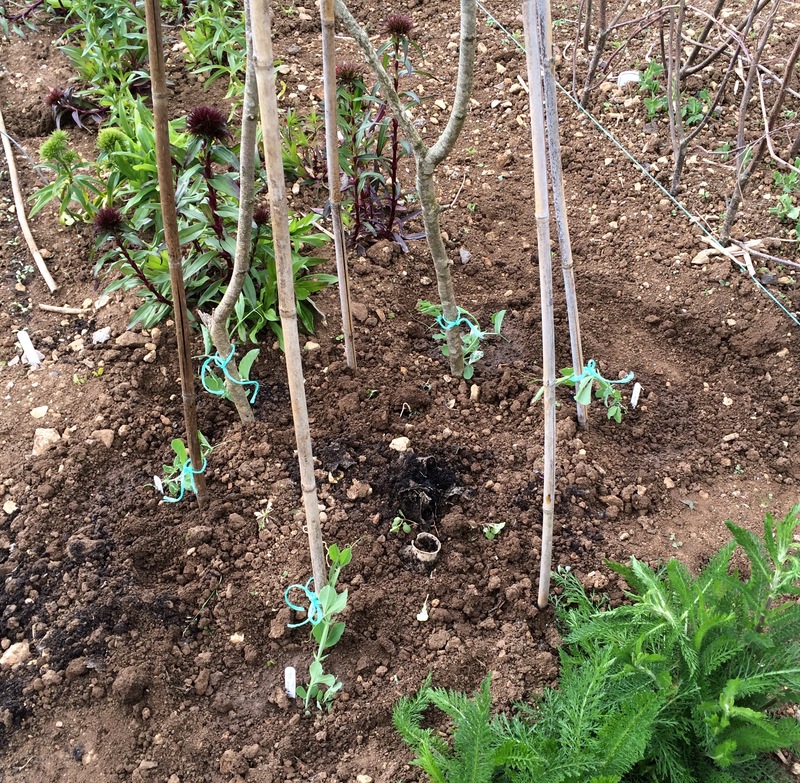 However, after the supports went up I dug a trench on one side (nearside in the picture) and filled it with manure. I couldn’t do the same on t’other side because it’s too close to the path – and hence my carefully planned (!) scientific experiment began. If I remember/can be faffed, I’ll weigh the takings from each side and report back later in the season. 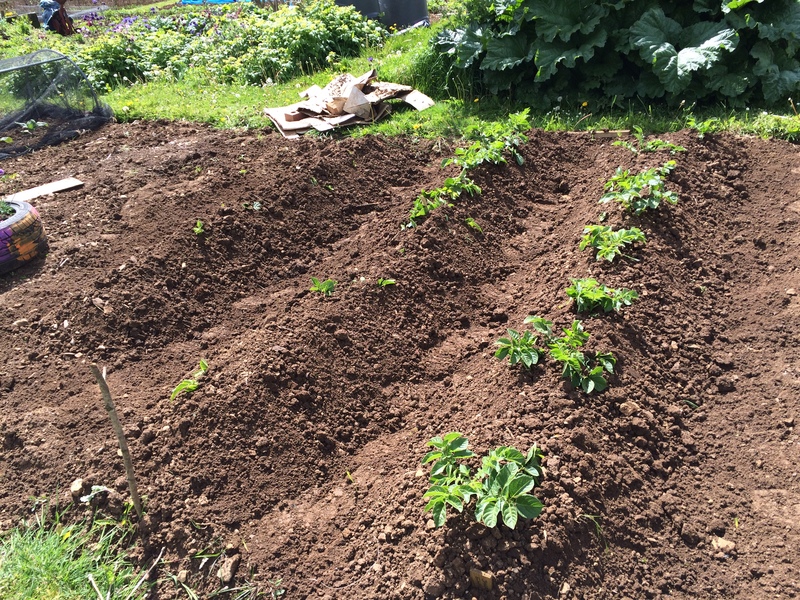 Finally I earthed up my spuds (Arran Pilot and Sharpe’s Express) for the final time. I find the earthy architecture of potato ridges very pleasing for some reason – fingers crossed there are lots of tasty morsels fattening up within. A bit of watering and some hoeing of weeds, and I was done. With just enough time on my way out to snap the strangely different appearance and behaviour of my purple sprouting plants. Both came as seedlings from my Dad, who sowed them from the same packet. One is rather green, tall, with long spindly stems and loose florets – and has already gone to flower. 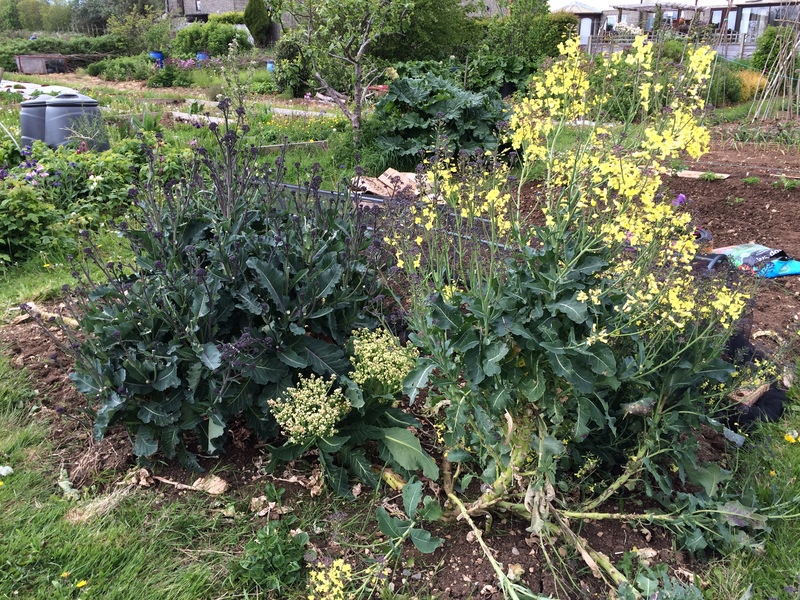 The other is deeply purple, squat, with thicker dark stems and tighter broccoli heads, and still has a few edible pickings left on it! Whatever the mix-up, I know which one I’d rather have again.